If you’re planning a whitewater kayaking road trip, Wisconsin probably isn’t on your list of destinations—yet. While many vacationers make their way to Northern Wisconsin during the summer months to enjoy cold-water lakes, forested trails, and an escape from the muggy climate of its neighbors to the south, most kayakers are unaware of the whitewater that flows through this picturesque Midwest destination. As soon as the ice thaws in the spring, however, everything from scenic canyons to convenient whitewater sections running right through towns opens up to boaters. To take advantage of Wisconsin’s idyllic weather and some of its best whitewater, check out the route outlined below. Located in central Wisconsin, the town of Wausau makes the perfect springboard for rivers to both the east and west. The popular park is a great way to meet other boaters and get local beta. Originally a slalom course, the play park has several fun rapids and small holes for beginner boaters to get practice as well as big holes designed for honing freestyle moves. The park is well maintained with camping and bathroom facilities nearby and costs $15 per day. From the Wausau Whitewater Park, this section of the Wisconsin River is just a half-hour drive. In summer 2017, releases are expected to be high and continuous due to construction on the dam that regulates the water. With the wall of water shooting out of the dam adding an extra intimidation factor, the releases transform the section into a big water, high volume experience. The Ice Age Trail that parallels this run makes the one-mile shuttle easy to set on foot. If the rapids aren’t enough to draw in kayakers, the beer stands set up at the base of the major rapids on the Wolf River ought to do the trick. This section is on the Menominee Indian Reservation and entrance to the river, shuttles, rafting, and river-side stands selling beer to passing boaters are all controlled by the tribe. A wristband and shuttle, which can be picked up at the take-out at Big Smokey Falls Rafting, will cost you $30. You can maximize your investment by using the paths along the edge of the river to carry your boat up and run the rapids multiple times. Named for the view of a monastery from the river, this four and a half mile section is littered with small rapids and catchy play waves. The main event is the Monastery Falls rapid midway down the run. Here, the river narrows and drops into a rock lined chute that creates a nearly river-wide stompy hole. 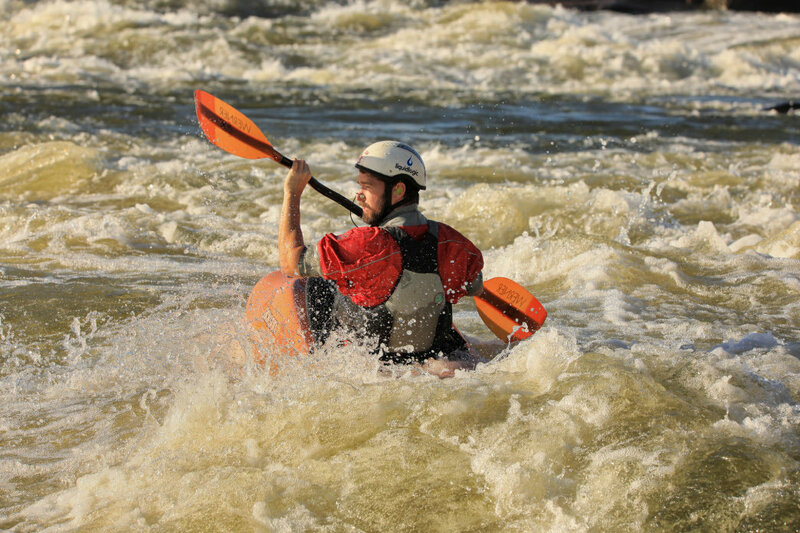 Reaching the Peshtigo brings you to Wisconsin’s whitewater hub. 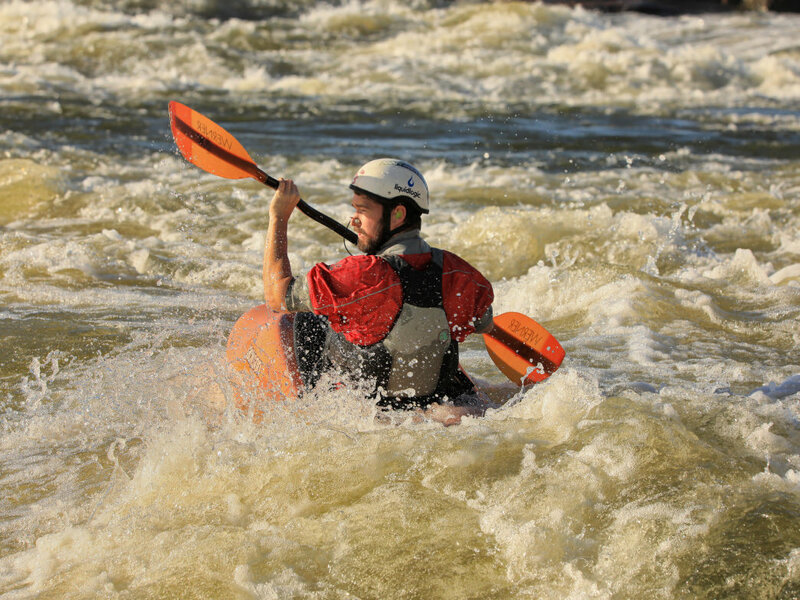 The most continuous in the state, the Roaring Rapids section is home to multiple rafting companies and boasts numerous great surfing spots that transform into monstrous holes at high water. The vibrant boater community in the area makes the Peshtigo a great spot to stay the night. Based at the take-out,Kosir’s Rapid Rafts is a popular spot for boaters to camp and can also double as a way to get a shuttle, either with the company or by meeting other boaters. Heading north to the Michigan border will bring you into a new caliber of both scenery and whitewater. Putting in below a rarely-run class V+ rapid at the base of a dam, the Menominee will carry you through the high canyon walls, ledges, holes, and wave trains of Piers Gorge. Making an arch through the Ottawa National Forest in Michigan’s Upper Peninsula will take you back down into Wisconsin for a remote canyon stacked with boulders, steep drops, and stunning scenery. This river, like many in the northern corner of the state, may not be running during a summer venture, so check flows before you make your way to the upper reaches of the state. Conveniently located just off the highway at Big Falls County Park, the Jump River makes for a great overnight stop as you can stay in the campground and make as many laps as you want on the section of river right in the park. A long stairway and a strategically placed bend in the river make it an easy walk back up to the top of the rapids. The farthest south your tour will take you is to the Black River. Depending on the level, and where you put in, it can range from class II-III play waves to IV-V big water uncharacteristic of the Midwest. Boaters can practice their skills here at low water and come back to put them to the test when the rock-lined riverbed fills after rains. Of course, you do. Once you dip your paddle in the Midwest’s whitewater, you won’t want to stop. Gear up with a dry suit and pogies (mittens that attach to your paddle) and come back during the late fall or spring for an added icy challenge. When you return, extend the trip to Wisconsin’s neighboring states of Minnesota and Michigan for more world-class whitewater tucked away where you least expect it. Note: Always check flows and local conditions before embarking on any river. For current water levels, scheduled releases, and driving directions, go to American Whitewater’s database. Ready to go more in-depth? Check out the region’s paddler’s guide.